What I did was to copy my Bookmarks (including Subfolders) to the Bookmarks Bar, and when I now click on the Bookmarks tab on the Bar, all of my Bookmarks appear in a dropdown menu, just like in O12. If someone can show me how to upload an image here, I can display it for y'all. Also included on my bookmarks bar are a few of the Subfolders I often use, so I don't have to navigate the normal Bookmark tab. If you don't think this is a more convenient arrangement than the native way to access Bookmarks by calling up the Bookmarks (ctrl/shift/B) in Opera, well, I must be deranged. What could be easier than to click "Bookmarks" (or whatever I want to name my Bookmarks and all folders within) to access every bookmark arranged how I like them, and using folders. When I want to delete or edit a bookmark I click on the "Bookmark" "tab" on the Bookmarks bar, find the bookmark and right click it...or if I want to move its placement, I click and hold and move it to wherever I want, all this not having to use an extension. Adding a Bookmark of the current page is as simple as clicking on the Bookmark addition to the Bar, either "+ add page" to the Bookmarks, or open whatever folder listed below, and click on THAT folder, and "+ addpage" it gets added to the bottom of the list, at which time I either leave it there or move it right away to where I want it in that sub-folder (click and hold, move). Actually this is easier than we had in O12.17, where you had to open the bookmark manager to move bookmarks around. This way also allows me to stay right on the page I am viewing, click on the dropdown box, right click the bookmark and open it in a new tab, or a new window, or a new private window; add it to speed dial, edit or move to trash. There has been no way or other extension that mimics the Opera 12 Bookmark system that so many complained about when we migrated out of Presto. Good work bbildman! I put a folder with my personally collected bookmarks on the bar, but you've shown me some ways I can work with it that I wasn't aware of. Thanks! Like I said, this arrangement completed the circle for me from 12 to 33 - and now New Opera is stunningly good. I can right-click on my bookmarks folder in the Bookmarks Bar, or any of its subfolders, and select Sort alphabetically. I can move the mouse to any bookmark and press Ctrl+Shift and click the mouse to open it immediately in a new foreground tab. which you can bring up as a side bar with Ctrl+Shift+S Bookmarks sidebar interface. The only reason I installed that was because if you want to do a search for a specific bookmark in the Ctrl+Shift+B Bookmarks sidebar interface, it does the search but does not tell you WHERE that bookmark is located. TheV7 Bookmarks is outstanding in that if you search for a specific bookmark it will display it in tree view and tell you if it occurs anywhere else and where it is. All the three notes I knew, and yes, the possibilities are WAY more extensive doing bookmarks this way. As you saw with the images I noted, I have some other subfolders dragged from the Bookmark tab directly on to the the Bookmarks Bar. V7 Bookmarks is an awesome extension. Thanks for recommending it. The V7 Bookmarks extension looks good, but I want to be clear about alphabetization. I am more or less happy with the latest Opera--held out for years with Opera 12 waiting for a bookmarks fix--but I am finding it a major PITA to constantly have to alphabetize my bookmarks. Does this extension have a permanent sort order feature? Or am I not understanding something about standard Opera? I'm with you on this, haleba. I don't know about V7, but at least in Opera 32 alphabetical sorting is strictly manual. Thanks, vux777. In a few weeks I will have some time to upgrade from Opera 32 to 33 (or 34 if it is out by then), and then I'll see how things look and perhaps look into V7. Frankly, I'm trying to avoid complicating my life with extensions, but if it's a big improvement it will be worthwhile. Just installed V7 Bookmarks and it looks to be working like a charm organizing my bookmarks. Past history at this point, but I think Opera 32 imported my bookmarks unsorted, which severely ticked me off. Past history because--Presto!--one click and all my folders are alphabetized. I have 2000+ bookmarks that I use extensively as a productivity/research toolkit, so not having to constantly reorder them helps tremendously! Note to others with this issue: V7 Bookmarks does not sort (or see) bookmarks outside of the main bookmarks folder/Speed Dial areas, so imported sessions and Opera bookmarks aren't sorted. but once they're moved to the primary bookmarks area you're set with one click. Still missing the the detailed bookmark tracking and annotation features of the old Opera--looking into an external bookmarks application for that--but this is a great starter organizer. Thanks again to all for this lead. Note to others with this issue: V7 Bookmarks does not sort (or see) bookmarks outside of the main bookmarks folder/Speed >Dial areas, so imported sessions and Opera bookmarks aren't sorted. but once they're moved to the primary bookmarks area >you're set with one click. Didn't notice that features. Apologies. But the operational note stands for bookmarks in the primary work area of the extension, i.e. once the Other Bookmarks are in the work area sorting would only affect them. Please correct if this is wrong. Understood your method: my replies were to the add-on comments about V7 Bookmarks that addresses my vexation about manual sorting. I use the Speed Dial for priority-order bookmarks. I'm the opposite on using drop-downs because I have so many sub-folders I find it difficult to get my mouse pointer lined up to run through them and almost always go to browsers' bookmark manager feature to pull up sub-folder links. rif, what I did was to open the Opera native bookmark manager, (cntrl-shift-B) and snimply dragged the Imported Bookmark folder onto the Bookmarks Bar, from there you can change the name of the folder as you wish. At that point, you will have a Bookmark folder on the Bookmark Bar. That new tab/folder can be clicked and you will have a dropdown box with all of your imported bookmarks including subfolders. let me know if I am not clear as to how to do it. yes, I excluded Imported bookmarks folder from sorting (on settings page) and also canceled/grayed Sort button on panel when Imported bookmarks are active. At the time when I was writing this extension, opera didn't had sort functionality. 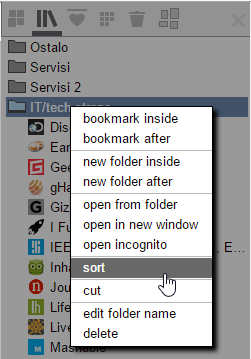 rif, what I did was to open the Opera native bookmark manager, (cntrl-shift-B) and snimply dragged the Imported Bookmark folder onto the Bookmarks Bar, from there you can change the name of the folder as you wish.